It's always a difficult decision.... Do you eat the last Rolo in the packet yourself, or do you offer it to your best friend with the attendant risk that they are going to offend you by taking it. Well here's what you can do to the last Rolo to make sure that you both get a bit. 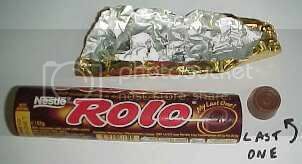 Here's the last Rolo in the pack. 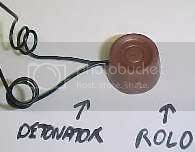 And here's a detonator (electric match). The detonator is inserted firmly into the smooth toffee centre. It made quite a bang followed by the stereophonic effect of two separate halves of a Rolo bouncing off theatrical lighting fixtures in the vicinity. After quite a search covering a large area of our lighting store we finally located the two parts of the Rolo and observed how the chewiness had been momentarily suspended during the explosion, and the Rolo had sheared neatly with a slightly polished effect. 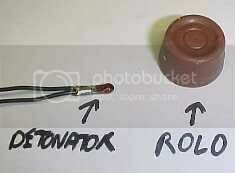 Obviously given that the Rolo is now coated with burnt oxides of explosive matter, it shouldn't actually be eaten.